Sixteen years ago Stewart Golomb (a veteran third grade teacher) started making pickles in his tiny East Village apartment in New York City. The initial goal was to see if his pickles could be better than what was currently available on the street in NYC’s Lower East Side (former pickle mecca). Batch after batch he tested and tested. Ad absurdum. The refrigerator in the small NYC apartment was constantly filled with test batches. Which necessitated the extremely popular pickle-tasting parties to make room for more test batches. The overwhelming response to the pickles fell somewhere between unbridled enthusiasm and mania. MoonBrine was born. Armed with his love of food, fun and a mission to bring some simple joy to people’s lives, he attacks the pickling process with an intensity hard to come by unless you’re just plain intense, aka Stew. From New York City, Stew moved to Boston, Massachusetts where he brewed and sold his fermented pickles for seven years. Continuing his mission to spread the love of pickles, Stew moved MoonBrine World Headquarters to the great Pacific Northwestern city of Portland, Oregon where he is producing out of the Historic Ford Building located in Southeast Portland. From the Great Atlantic Northeast to the Great Pacific Northwest – Pickles for all! Flavor. It's what it's all about. Our two varieties of fermented pickles are brewed in small batches using only all natural ingredients with absolutely no preservatives. So they actually taste like a pickle should. Handcrafted. Hand packed. All for the love of the pickle. Our delicious pickles are gluten free, fat free and contain zero trans fats. Crunchy. Healthy. Daily. No worries, friend. Pickles don't hurt anybody! MoonBrine Pretty Hot pickles are just that. Pretty hot, but not too hot. Just hot enough! They're plenty enough to wake up your soul! Available at MoonBrine and retailers - see store listings. INGREDIENTS: Water, Cucumber, Distilled White Vinegar (certified gluten free), Onion, Horseradish, Salt, Garlic, Hot Pepper, Spices. We don't mean to get super sassy here, but shouldn't a dill pickle taste like dill? MoonBrine Super Dill. Taste buds, meet dill. Dill, taste buds. Available at MoonBrine and retailers - see store listings. INGREDIENTS: Water, Cucumber, Distilled White Vinegar (certified gluten free), Onion, Fresh Dill, Horseradish, Salt, Garlic, Hot Pepper, Spices. Your daily elixir for the soul! Use in marinades, dressings, cocktails or straight up! Available at the shop! Other MoonBrine Products Sold Exclusively at the MoonBrine Shop N' Snacketeria! Stew serves up other rotating offerings of deliciousness including: half-sour cucumber pickles, pickled cauliflower, pickled carrots, pickled asparagus, pickled cabbage, pickled green beans, pickled turnips, pickled radishes, sour mash relish, pickled green tomatoes, and whatever else comes off the farm and lands in the brine. Follow MoonBrine on Facebook & instagram to keep up with what's available at the shop. pickle is a delicious pickle! to the MoonBrine Shop N' Snacketeria. It's a secret, but we will tell only you, it's down by the railroad tracks at the corner of SE 11th Avenue and SE Division Street in the basement of the fabulous Ford Building located in Southeast Portland, Oregon. There you will find quart glass jars of our famous fermented MoonBrine Super Dill and Pretty Hot Fermented Pickles and our MoonBrine Brine, a magical product all on its own. Use the brine for cooking, cocktailing or just drinking straight up. sour mash relish, pickled green tomatoes, and whatever else comes off the farm and lands in the brine. The Shop N' Snack also sells Martin's Handmade Hard Pretzels from Pennsylvania. So come on down, take a couple of jars home and help spread the love of the pickle! Pickle down! Email Stew for wholesale info & pricing. 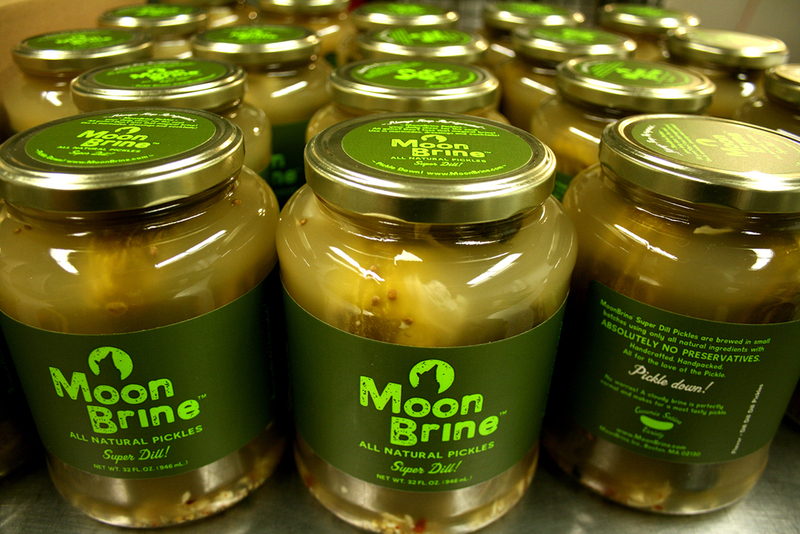 RETAILERS: Interested in selling MoonBrine Pickles in your shop? MoonBrine's Pickles will be some of the most popular items in your refrigerator section. Customers old and young will not be able to resist. Cool packaging, hearty pickles and the visible natural ingredients make for a most desirable product. Everybody Loves Pickles! RESTAURANTS: Our pickles are the perfect addition to your menu. Serve them on the side or fry them up for a most addictive appetizer! BARS: MoonBrine Brine is available for wholesale. Great in cocktails or as a pickle back! Add the brine to a Bloody Mary and throw in a pickle instead of celery. The Pretty Hot Brine will give it some major punch! Or try a MoonBrine Pickletini. Our brine puts that olive juice to shame! CATERERS: Our pickles are the perfect compliment to your meals! CRAFT SERVICE: The crew will beg for more! Refreshing and hearty - you'll be the hero of the shoot. Great in sandwiches too! Parking: Street parking on Division Street and customer parking lots on either side of SE 11th just past the Ford Building.